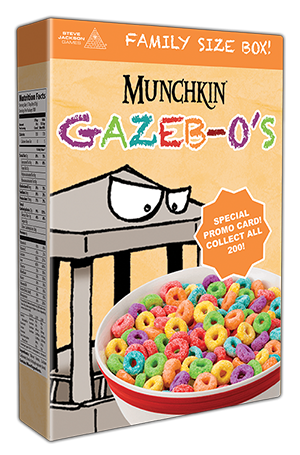 Daily Illuminator: Announcing Munchkin Gazeb-O's, Part Of A Balanced Breakfast! April 1, 2017: Announcing Munchkin Gazeb-O's, Part Of A Balanced Breakfast! Tired of the same old morning routine? Then kick down the door, fight the monster, and eat a balanced breakfast with Munchkin Gazeb-O's! These fruity oat loops are full of the real treasure: fiber and nutrients! Energize for a day of dungeon delving and monster bashing with a tasty breakfast that stays crunchy, even in milk. You can't have soggy cereal if you expect to get to level 10! It's a treasure chest of flavor, ready for you to loot. Plus, each box contains one randomly inserted, cereal-themed Munchkin promo card! Collect all 200! Look for Munchkin Gazeb-O's at your friendly local cereal aisle soon. Don't share with your friends, though. You have to eat the Munchkin Gazeb-O's alone!